I’ve read many articles stating a link between faster page loading and better user engagement, but with limited evidence. So I looked at hard data from 1,840 websites and found that there’s really no correlation between page load speed and bounce rate in Google Analytics. Read on to find out why. The oft quoted statistic on page load speed is from Amazon, where each 100ms of extra loading delay supposed to cost Amazon $160m. Except that the research is from 2006, when Amazon’s pages were very static, and users had different expectations from pages – plus the conclusions may not apply to different kinds of site. 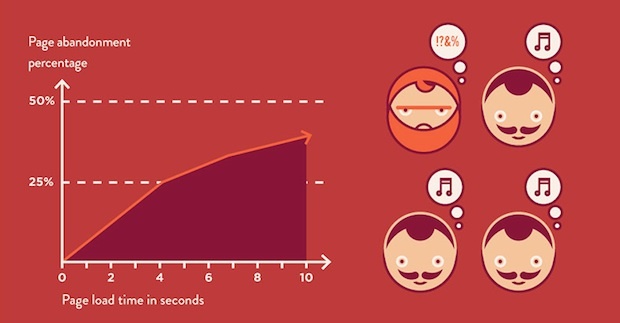 So reducing load speed from 15 seconds to 7 seconds was worth an extra 24% conversion, but only another 8% to bring 7 seconds down to 2 seconds. Does page speed affect bounce rate? We collected data from 1,840 Google Analytics web properties, where both the full page load time (the delay between the first request and all the items on the page are loaded) and the bounce rate were within normal range. We then applied a Spearman’s Rank Correlation test, to see if being a higher ranked site for speed (lower page load time) you were likely to be a higher ranked site for bounce rate (lower bounce rate). Many of the smaller websites we sampled for this research operate in niche industries or locations, where they may be the only source of information on a given topic. As a user, if I already know the target site is my best source for a topic, then I’ll be very patient while the content loads. One situation where users are not patient is when arriving from Google Search, and they know they can go and find a similar source of information in two clicks (one back to Google, and then out to another site). So we see a very high correlation between bounce rate and the volume of traffic from Google Search. This also means that what should concern you is speed relative to your search competitors, so you could be benchmarking your site speed against a group of similar websites, to measure whether you are above or below average. As a user landing on your site I am going to make some critical decisions within the first 3 seconds: would I trust this site, is this the product or content I was expecting, and is it going to be easy to find what I need. If your page can address these questions quickly – by good design and fast loading of the title, main image etc – then you buy some more time before my attention wanders to the other content. In 2009, Google tried an experiment to show 30 search results to users instead of 10, but found the users clicking on the results dropped by 20%. They attributed this to the half a second extra it took to load the pages. But the precise issue was likely that it took half a second to load the first search result. Since users of Google mainly click on the first 3 results, the important metric is how long it took to load those – not the full page load. Many websites already use lazy loading of images and other non-blocking loading techniques to make sure the bare bones of a page is fast to load, especially on a mobile device, before the chunkier content (like images and videos) are loaded. This means the time when a page is ready for the user to interact with is not a hard line. SpeedCurve, a tool focussed entirely on web page speed performance, has a more accurate way of tracking when the page is ‘visually complete’ based on actual filmstrips on the page loading. But in their demo of The Guardian page speed, the page is not visually complete until a video advert has rendered in the bottom right of the screen – and personally I’d be happy to use the page before then. What you can do with Google Analytics is send custom timing events, maybe after the key product image on a page has loaded, so you can measure speed as relevant to your own site. But doesn’t speed still affect my Google rankings? A little bit yes, but when Google incorporated speed as a ranking signal in 2010, their head of SEO explained it was likely to penalise only 1% of websites which were really slow. And my guess is in 7 years Google has increase the sophistication with which it measures ‘speed’. So overall you shouldn’t worry about page load times on their own. A big increase may still signal a problem, but you should be focussing on conversion rates or page engagement as a safer metric. If you do want to measure speed, try to define a custom speed measurement for the content of your site – and Littledata’s experts can work with you to set that custom reporting up.